I felt fine when I went to sleep last night. But I must have inhaled a pound of goldenrod yesterday because I woke up today with the impossible to miss signs of early stage bronchitis. My post nasal had been dripping all night. It felt like swallowing a swallow (or anything the size of a small boney bird) every time I took a slug of morning joe. Aside from the sore throat, and a worn throaty speaking voice, I felt wiped out. I felt like I had slept 2 hours when I had actually slept almost 7. I decided it would be smart to take a sick day. Nip this thing right in the bud. Stay home, watch movies, eat popcorn, and heal up. Such thoughts made me smile ear to ear. And then I thought about Louie Zamperini. Louie grew up a poor little thief in Torrance, California. He constantly stole food, bikes, money, anything. He ran away so fast with the booty that he could not be caught. After flunking his way into the 10th grade, he began to run track. By the time he was 20, he had broken every amateur miler record in the books and run the 1500 meters in the 1936 Olympics in Munich. By 1946, he had been shot down in a B-24 over the Pacific, been marooned on a raft at sea for 47 days, and been interred in a series of Japanese P.O.W. camps over 3 years. He was constantly tortured, denigrated, forced to haul fece, do push ups in fece, and live in fece. He dropped 70 pounds. Finally, he was allowed to soar on the wings of liberation just 7 days before he was to be executed with every other P.O.W. held in the waning days of WWII. By 1952, Louis had staggered through years of despair. He was fleeced in a series of sham investments, been married to a special woman but never felt psychologically well enough to make the marriage work. By then he had also met Billy Graham. The preacher helped Louie find peace, and the love to forgive the men who cut him, kicked him and punched him in the face every day for 3 years. I choked back tears when I read how Louie felt when the prison guards ran away from the prison in August of 1945, leaving the emaciated Allied GI’s free to watch American pilots tossing provisions from the sky into the prison yard. I welled up again when Louie found withheld mail containing family photos, beloved that he had not seen in 5 years. The Japanese had denied him his life, his family, and his dignity. With all of that in mind, I thought, shoot, I can go to work. If Zamperini could be knocked down 10,000 times and come up standing with feces and blood about him, how could I ever complain about the comparatively small problems that I endure? Louis is 95 years old now. 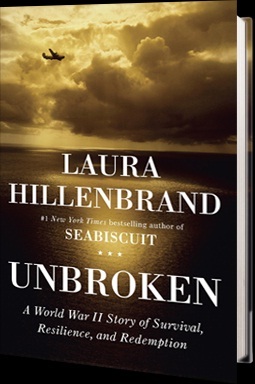 I hope he lives long enough to see a movie made about his life, as was documented in Laura Hillenbrand’s acclaimed best selling book, Unbroken. Universal bought the option last year. Louie’s life is a testament to how much a person can endure, and how even the most heinous crimes can be forgiven by its victims. This entry was posted on June 1, 2012 at 2:06 am	and is filed under BASEBALL BOOKS. You can follow any responses to this entry through the RSS 2.0 feed. You can leave a response, or trackback from your own site.